The pelvic floor muscles are often not the first muscles that come to mind when we refer to the core, but as we discussed in Prenatal Core Training: Start Here, they are among the most important, especially during pregnancy. Properly functioning pelvic floor muscles can be the key to avoiding pregnancy pains and injuries, improving pushing, and minimizing tearing and other trauma during delivery. However, traditional guidance of encouraging “more Kegels,” with a focus on squeezing your “pee-stopping” muscles could lead to more harm than good. Read on to learn more about these important deep core muscles, and how to train them most effectively during pregnancy. 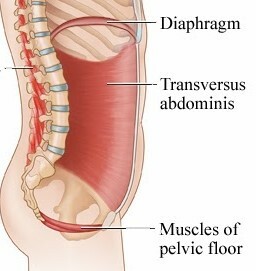 As a quick recap from Prenatal Core Training: Start Here, the pelvic floor (PF) muscles form the bottom of the Core Canister, or the “floor of the core.” The pelvic floor is actually made up of 14 different muscles in three different layers. These muscles have connection points at the front, back, and sides of the pelvis. During pregnancy, the PF muscles must be strong enough to support the added weight of your growing belly and uterus. They must also be strong enough to help counteract the effects of relaxin — a hormone that continues to increase throughout pregnancy, softening your joints and ligaments to enable your body to adapt to your growing baby and give you added mobility for childbirth. This softening effect decreases your stability, which can make you more susceptible to injury – especially when combined with a growing belly throwing off your alignment and center of gravity. Strong and properly functioning PF muscles can help resist these issues though. The PF muscles also help guide your baby out during childbirth. Therefore, they must be able to fully relax and open to allow your baby to pass through. Women who have the ability to fully contract and fully relax their pelvic floor muscles are much more likely to have the control necessary to prevent significant tearing during delivery. Given the above, the key to proper pelvic floor training is being able to properly work ALL the pelvic floor muscles through a full range of motion. This means you first have to learn how to find all the pelvic floor attachment points (your pee-stopping muscles are only the FRONT). Then, you can learn how to properly contract and lift these muscles, and also (perhaps even more importantly) how to fully relax and lengthen them. This can be a bit tricky to learn, so watch this video carefully to first learn how to find all the pelvic floor attachment points, and then how to activate them properly. It’s a good idea to try to do a few sets per day of the Pelvic Floor Activations (PFAs-Slow and PFAs-Fast) described in this video, where 1 Set = 3-5 PFAs-Slow + 8-10 PFAs-Fast. You don’t have to worry about doing tons of these. It’s more about getting to the point where you feel you’ve mastered the movements, and that you’re able to feel yourself fully contracting, but then fully releasing the entire range of muscles. These pelvic floor activations are great to do while watching TV, riding on a train or in a cab (not while driving please! ), or at various times per day sitting at your desk. This is the first exercise that comes to mind for most women when they think of pelvic floor exercises. However, we try to avoid this term for two reasons. First, because Kegels are often described by guiding women to “stop the flow of urine,” but as we discussed above, this only targets the front of the PF muscles. The other reason we prefer to avoid this term is that Kegels have become synonymous with just “clenching or squeezing” the PF muscles, but not as much attention is placed on relaxing or lengthening, which is equally (if not more) important during pregnancy. Like any other muscle in the body, a focus on chronically contracting — and not working through a full range of motion — can lead to muscle imbalances, and potential pains and injuries, especially during childbirth.